Unfortunately, there is a major, persistent problem with alignment! After spending quite a lot of time with it, I was able to prove that the image from the ESO site is badly distorted (internally), making a decent alignment within Celestia(.Sci) basically impossible (no matter what projection and/or coordinate range is assumed). So I contacted Serge Brunier, who confirmed these inherent distortions by email. Possibly, the reason was that he assembled his 224 individual frames with software, which --according to Serge B.-- does not have astronomical precision standards. Since the inherent misalignments are really disturbing, I started working instead on Nick Risinger's panoramic MilkyWay image, http://skysurvey.org/, that is also publicly available under a Creative Commons License up to 3000 x 1500 pixels resolution. Note: Unlike Guillermo's MW texture, neither a shift of the central meridian nor a vertical flip of Nick Risinger's image is required for the alignment! Hence, don't mix parts of the two add-ons, without knowing precisely what you are doing!! The shown Orion field is filled with red glowing hydrogen gas: in the north, the spherical nebula Sh 2-264 around the star lambda Orionis, in the lower left the huge arc called Barnards Loop, in the lower center at the three belt stars the well known IC 434 (including the prominent horsehead dark nebulae), and below Orions sword region with the great Orion nebula M 42/43. Note that the actual visibility of these nebulous regions depends on your monitor adjustments! I put all my image manipulation know-how in to produce a star-cleaned version of Nick's image that I think can hardly be improved given his largest available resolution of only 3000x1500. I am still waiting for an answer from Nick, about making a free 4096x2048 size available for Celestia(.Sci) under a CC license. Of course, much higher resolutions do exist, but they are not to be circulated freely in the net, since they form the basis for a solid wallpaper selling business. Last not least, here is an overview of the MilkyWay in Celestia(.Sci). Since Nick Risinger's original involves rather strong colors and high brightness, I have reduced both parameters by 50% which appears like a good choice. For details, license, installation,... see README.txt! Alignment data are in mw.dsc. Last edited by t00fri on Sat, 28-01-12, 21:05 GMT, edited 4 times in total. Thanks for the flowers...My God, I first have to remember how to make a frontpage for the CM web site My last one was done by Runar, ahem. I'll think about it, perhaps it's not a bad idea. Thanks Fridger, for the excellent update of Abramson's delightful addon. The creation of realistic views is now much enhanced. Many thanks for all your work most of which, unfortunately, goes over my head. PS I've just joined CM. From there I remounted two photographs with a H-alpha filter (left) and without (right). today, I received a reply (at last) from Nick Risinger. I had asked him whether he could release a moderately larger size of his MilkyWay image (4096x2048) under a Creative Commons license. On the one hand, the 4k size would contain considerably more detail than his presently available 3000x1500 map. On the other hand, some older graphics cards might not be able to handle bigger sizes than 4k. So 4096x2048 seems like a good compromise. ...I hope you can understand my intentions in keeping it exclusive (at least for the time being). ... Your use of the 3,000x1,500 image is still ok under the creative commons non-commercial attribution license. That's disappointing news, of course. Last edited by t00fri on Tue, 24-01-12, 22:20 GMT, edited 3 times in total. you had asked about the projections used in a previous email. The 3,000x1,500 image posted online is a Plate CarrÃ©e projection and it should have subpixel accuracy (every plate was assembled via astrometry with distortions eliminated). This hi-end accuracy matches with my own findings of a practically perfect alignment within Celestia! Good to see that you got an answer from Monsieur Brunier. And it is unfortunate the decision of Nick, but one needs to understnd the enormous work (and cost) involved in this panorama. Good to know, though, that he was conscious of astrometric precision. since I am working on a rather extensive systematic change in terms of "local spheres" (as sketched in http://www.shatters.net/forum/viewtopic ... 7&start=47), no blending in connection with the MW transition is yet implemented in the version I used here. However, I simply weakened the visibility of the original Milkyway rendering for observers positioned inside our galaxy (i.e. with |x|<R_milky). So in practice, the original, non-photographic rendering is hardly seen / disturbing for |x|< R.
Note that also in my render.cpp code of the standard 1.6.1 version, it is possible to modify the settings accordingly. This just requires rebuilding. The modification does NOT affect the brightness of our galaxy for |x|_observer > R_milky! Another change is that at small Automag zoom (<-> unaided vision) the color saturation may be set to vanish automatically. This simulates the fact that the naked eye only sees galaxies and globulars without colors... There is also a new key that allows to increase color saturation any time according to gusto. To render color of DSOs in a scientifically reproducable manner (color profiles!) and to include multi-wavelength astronomical displays is an important new aspect of Celestia.Sci. Last edited by t00fri on Sat, 28-01-12, 20:27 GMT, edited 2 times in total. The much improved rendering of galaxies and globulars is part of the Celestia.Sci version that I currently use. Yes, these are fantastic improvements. // brightness(appMag = faintestMag) = 0.2, as desired. 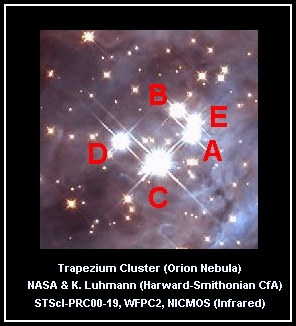 You know that by definition appMag = absMag at a distance of only 10 pc = 32.6 ly from the DSO center. Since galaxies have a much much bigger radius than 32 ly, the quantity r denotes the apparent brightness of the DSO an observer sees from inside. So all you got to do is to adjust the value of r.
The actual value depends on your taste and the settings of your monitor. People who want to have a brighter Milkyway and don't want to use the photographic MW background should make r bigger e.g. by a factor of 2. In render.cpp, it's actually the variable 'enhance' that is best adjusted, if you want a less bright appearance of the default MilkyWay galaxy for an observer located within the galaxy (|x|<R_gal). // The parameter 'enhance' adjusts the DSO brightness as viewed from "inside"
// enhance the too low sprite luminosity at close distance. Note that enhance can be negative as well! You can easily find the place if you search for 'enhance'. Oh, I see. But the r parameter actually worked well. Thanks.